Learn more about Tammy Busch, Realtor with F.C. Tucker Emge REALTORS. 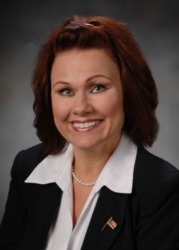 Meet Tammy Busch, Evansville’s Favorite Real Estate Agent! Choosing a knowledgeable and experienced REALTOR® is the key to success! Tammy’s knowledge of the industry will effortlessly guide you through the process and make the transaction seamless, while keeping stress levels at bay. Tammy has had success in working with both buyers and sellers and will work tirelessly for you. Years of experience and her knack for identifying any potential roadblocks have given her the know-how to close transactions expediently and with as few issues as possible. Tammy takes the time and enjoys getting to know her clients and their families. Your trust and comfort with her will be at the forefront and the connection you build won’t end after the closing. Tammy goes above and beyond with personal touches and extra gestures. Whether it’s delivering a home cooked dish to your new home or crafting a gift basket with your favorite coffees, chocolates or books, you’ll realize she’s more than a REALTOR®…she’s a friend! Tammy’s clients feel valued, important and appreciated because they are. Actions speak louder than words. A positive attitude, an energized spirit and exemplary customer service is what she strives for. Talk To Tammy Busch Today! She’ll sit down with you and talk about a realistic time frame to get your home on the market or find your dream home. If you aren’t quite ready, you can talk about that too. Knowing what steps you need to take to accomplish your goals is the first step. Together, you’ll devise a plan towards your success. Tammy is ready to answer your questions, with no obligation whatsoever. As an Evansville native, I truly love my City and know it inside and out. The history and culture is just incredible and warrants much pride. My family settled here in the mid-1800s. My Great Great Grandparents studied at Willard Library in the late-1800s, and my Grandfather worked in the LST shipyards during and after WWII. Evansville continues to thrive, expand and evolve as it serves as the commercial, medical, educational and cultural hub for the Indiana, Kentucky and Illinois region. I know our town thoroughly so who better to help you settle in the area or find qualified buyers to purchase your home? I entered the workforce at the young age of 14 and studied business management at USI. The skills and tools I use in my day-to-day Real Estate business were cultivated while working in various fields of management (restaurants and hotels), Marketing & Advertising and Human Resources. I’ve developed a strong work ethic and a knack for “getting things done.” I attribute my strong family values, a never wavering faith and an honest agenda to how I live life. I’ve been married to my best friend, Joseph, for 30 years and our pride and joy is Alexandra, 23. She recently graduated from USI, with honors (and a double major) in Economics and German. Did I mention she earned her degree in record time, while holding down a full-time job? We are dog lovers and another member of our family is ‘Lewie’ (Boxer mix, rescue). He never fails to greet us at the door, as if we’ve been gone for decades. What an uplifting experience, as we arrive home after a long day. It doesn’t get much better than that!